Despite all my efforts, I’ve never really learned how to make pasta from scratch. On a recent trip to Bologna, I was determined to change all that. 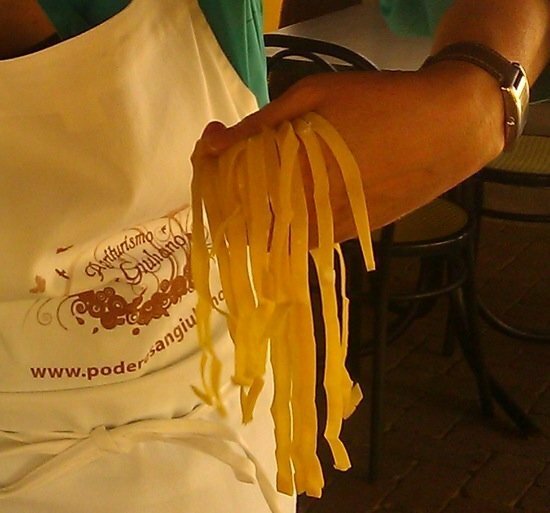 I took a pasta-making class at an agriturismo, a working farm and inn on the outskirts of Bologna. 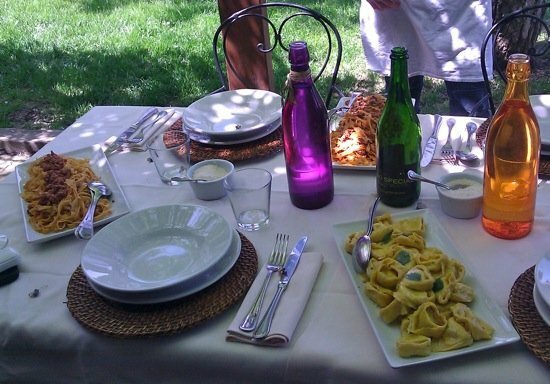 For the last ten years, Federica Frattini and her husband have run Podere San Giuliano, hosting overnight guests and feeding them in the restaurant on site. 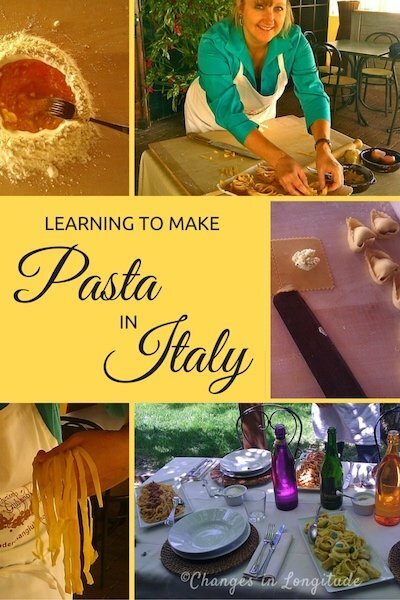 Their mission is to showcase the foods and cuisine native to Bologna and its surrounding region of Emilia Romagna, which of course includes fresh pasta. Our “How to make pasta” class began with a brief overview of Ragu Bolognese. Federica’s Bolognese was somewhat different to what I had learned (she does not use milk, for instance) but this wasn’t surprising. Legend has it that if you questioned 100 women from Emilia Romagna, you’d likely get 101 different recipes for the signature sauce of the region. Sauce-making was all very interesting, but I had really come for the messy stuff: turning flour and eggs into pasta. Out to the “classroom,” where each student had a workstation and an apron (much-needed) waiting. Federica showed us how to shore up our flour craters with one hand while continuing to blend in the eggs with the other. Eventually I managed a sticky lump, although smaller than Frederica’s since a large portion of the ingredients now coated my hands in a crusty mess. With hands appropriately un-gooed, we then kneaded our lumpy dough balls. A few minutes later we each had a smooth, silky mass that looked promising. 2. Rolling: I confess that I have always cheated a bit on this step. My sister once gave me a hand-crank style pasta maker so I could avoid hand-rolling. 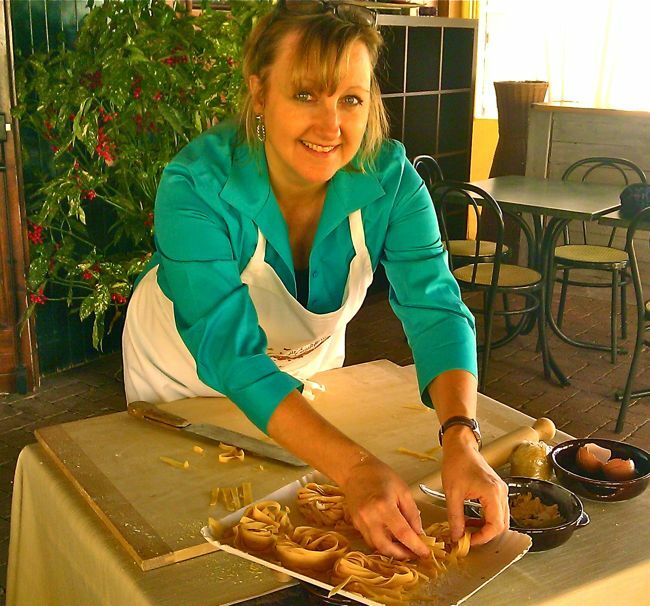 Not so in Frederica’s class: “you want to make fresh pasta, you roll by hand”. I’m no stranger to a rolling-pin (no, I have not used it on Michael) but I can do a pretty mean pie crust. However, pie crust is soft and malleable. Something about this golden elastic dough was intimidating. 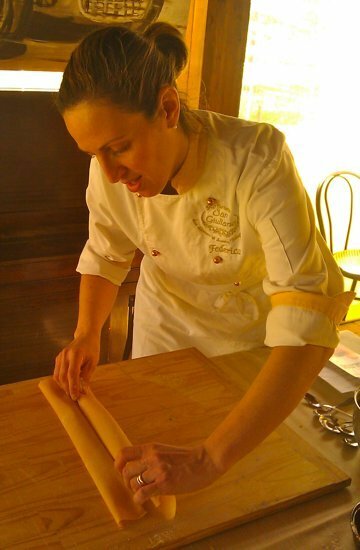 With the patience of a saint, Federica demonstrated how to flatten and stretch the dough. 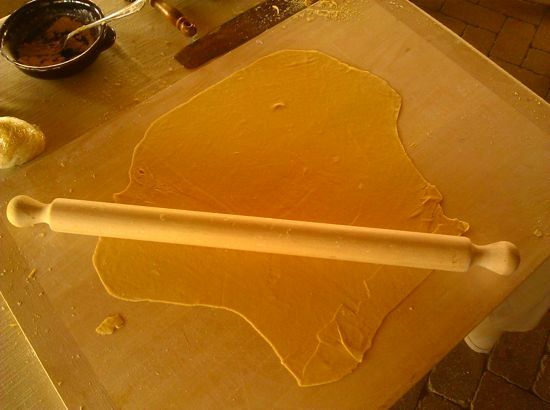 Drape over the rolling-pin, start at the edge of the board, and press and roll. Drape, press, roll. Repeat. To my astonishment this technique worked and I had large, flat sheet of pasta dough lying complacently in front of me. 3. 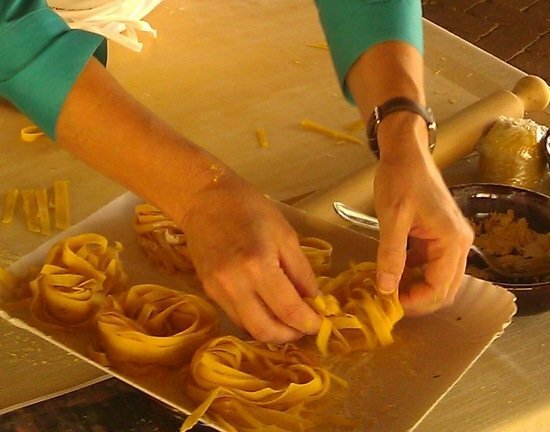 Cutting tagliatelle, making nifty nests: In the past I had simply run my narrow sheet of pasta through the cutting blades of the pasta machine, then laid them in a haphazard pile on a towel. But that technique wouldn’t cut it here. 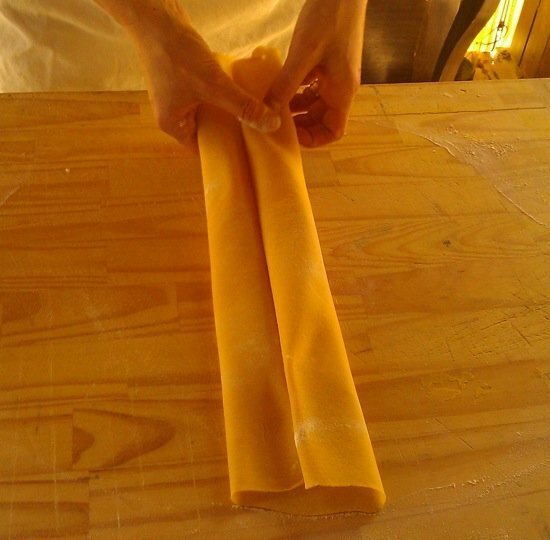 Before slicing tagliatelle roll both ends of the pasta sheet toward the center then slice across the rolls from left to right into 1/4″ strips. 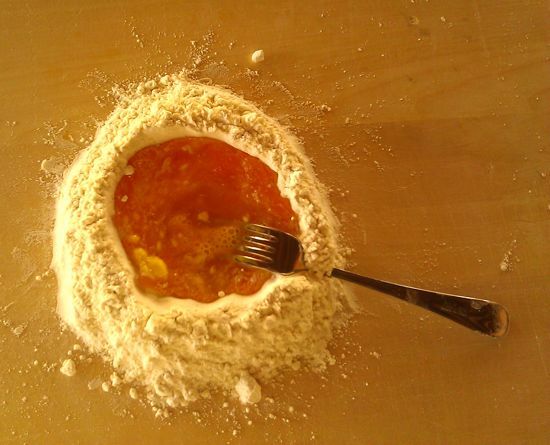 . .
Slide a knife under the sliced pasta and lift. . .
Lightly grasp a handful of the sliced pasta and. . .
(This will equate to roughly one portion when cooked.) Place on a dish to dry slightly before cooking. 4. 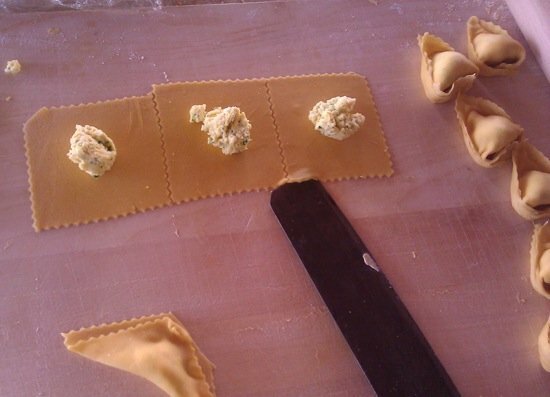 Stuffing and shaping tortelloni: We used a fluted cutter to divide our second sheet of pasta dough into 3-inch squares and placed a teaspoon of the ricotta filling in the center. Then came the tricky part: folding and pinching. I had tried this at home and usually come up with something that was functional and tasty, but not very pretty. 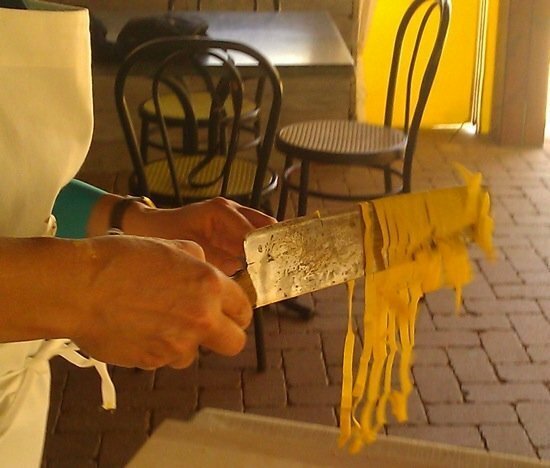 Federica demonstrated the “vertical pinch”: after sealing the pasta closed into a stuffed triangle pinch each side toward the bottom (hypotenuse for you geometry-prone.) This creates a slightly 3-dimensional pocket for the filling, making it less likely to open up during cooking. Roll the corners around two fingers and pinch closed for the final effect. 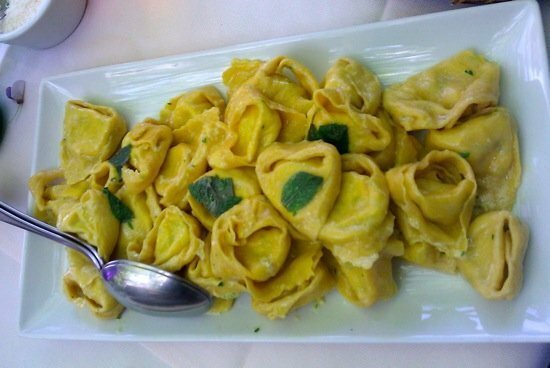 Tortelloni are larger than their better-known cousins, tortellini—which would have been a little too delicate for our clunky neophyte fingers. 5. EATING!!! : While the fruits of our labors were taken back into the kitchen to cook we went out to the wisteria-shaded veranda to enjoy some antipasti. While nibbling on some local mortadella along with fresh-baked crostini we looked out over the farm and gardens. Later in the year those fresh peaches and tomatoes will appear on the menu, along with whatever else is ripe. Then, the moment we had worked for: the pasta arrived at the table! 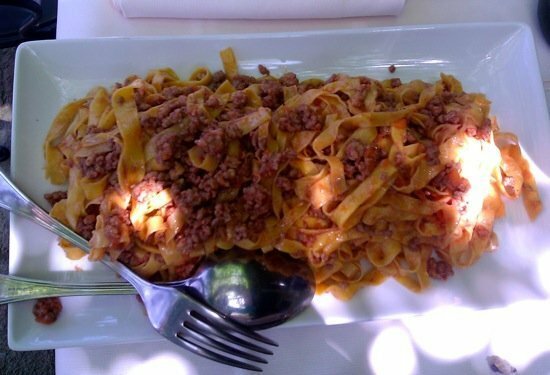 Tagliatelle with the signature ragu Bolognese and the tortelloni dressed with a simple sauce of burro e salvia—melted butter and sage. Sitting with Federica and some of her staff we enjoyed a pranzo alla Contadina al fresco—country-style lunch served outdoors. The elegant simplicity of the meal with its ultra-fresh ingredients was one I will long remember—it tasted even better knowing I crafted the pasta myself. My only regret was that I had not booked one of the podere’s comfortable guestrooms—a nap afterward would have hit the spot. Many thanks to Federica and the staff of Podere San Giuliano for hosting me at this class, and to the staff of Blogville Emilia Romagna for making the arrangements. If this post got you hungry click the link for other food stories.